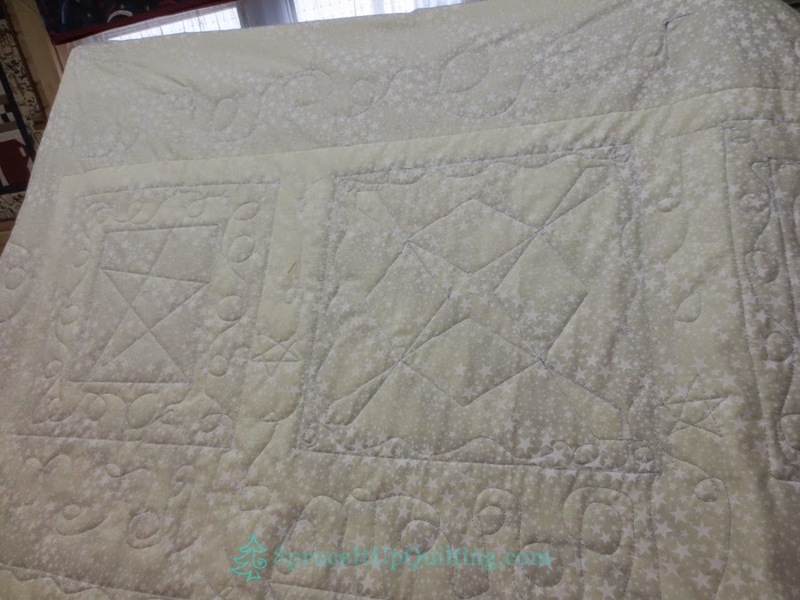 Spruce It Up Quilting: Snowmen! 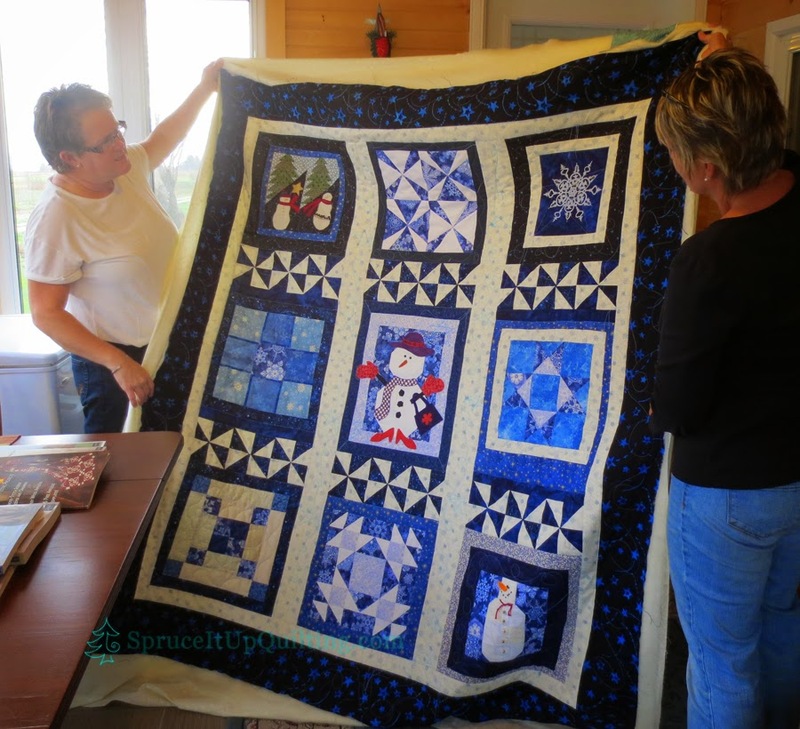 On this snowy Sunday, Nov 2nd 2014, at least for some parts of New Brunswick (and some other parts of Canada), it is fitting to showcase photos of Marsha's snowmen quilt. This was a windfall of a guild/quilt group's effort: she won the appliqué blocks and constructed the remainder of the blocks from her collection of fabrics. What a beauty! The Death Grip! 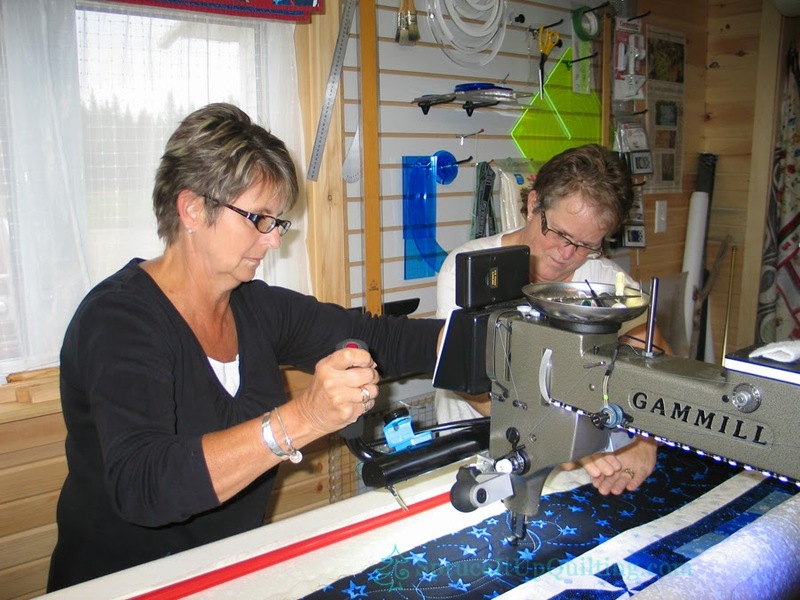 At the end of a long day quilting, you just want to make sure everything works out perfectly... the store was busy that day and Hollie was a terrific supporter and advisor to Marsha. Marsha free handed the whole quilt!! BRAVO!! I have the best fun looking at the backings... this one is gorgeous with the star tone-on-tone fabric. Very appropriate! And here it is in all its glory! What a fabulous quilt. 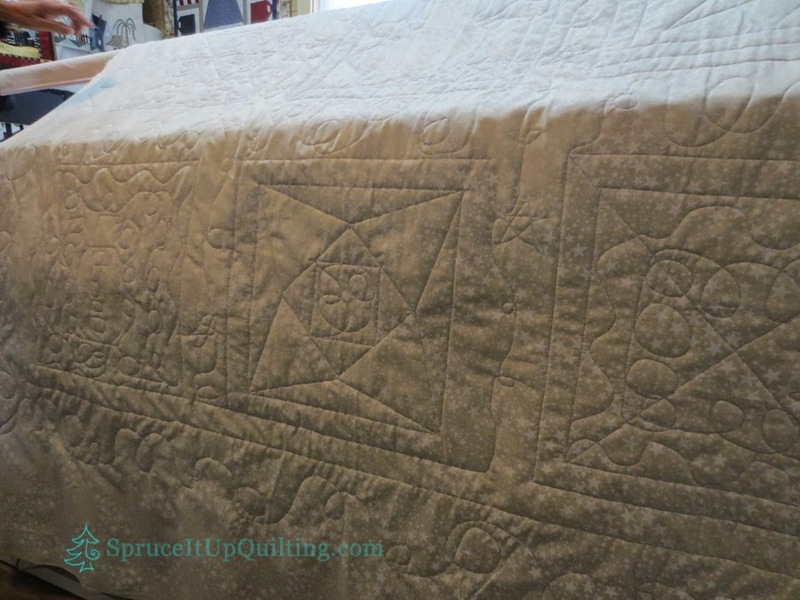 Marsha chose a wool batting for this quilt and the loft is perfect. Thread is by FilTec called Tar Heel which is a beautiful pale blue and on that border and the dark fabrics it sparkles! Marsha mentioned she would never have chosen that one had she not seen it on her quilt when auditioning from a large selection of thread. It just goes to show that what you think will NOT look good on your quilt might be a wonderful surprise! It's just fabulous Marsha! You did an amazing job! Hollie also deserves an applause for all the help she provided! One could just see the "wheels" turning in her head at how she will tackle her time on Lolah!! 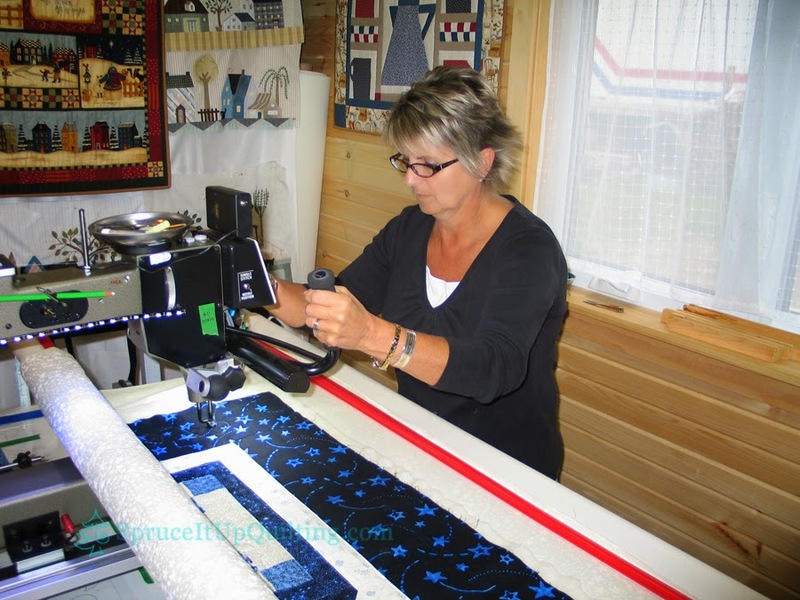 Can't wait to see what you will quilt on Lolah, Hollie!! Lovely work, isn't it? I would have been happy with snowflakes ONLY on fabric for a while longer, Lorette ;) Oh well, the school kids are happy with a longer weekend! I'm sorry if it snowed where you are! Nov 2nd is too early for it! I'm happy we didn't get any at all although that rain was pretty cold and the wind made it seem colder. Thanks for stopping by the blog Monique! It's a sweet quilt! Yes we were lucky not to get snow and it's warming up a little for the next few days too... I consider this a bonus! 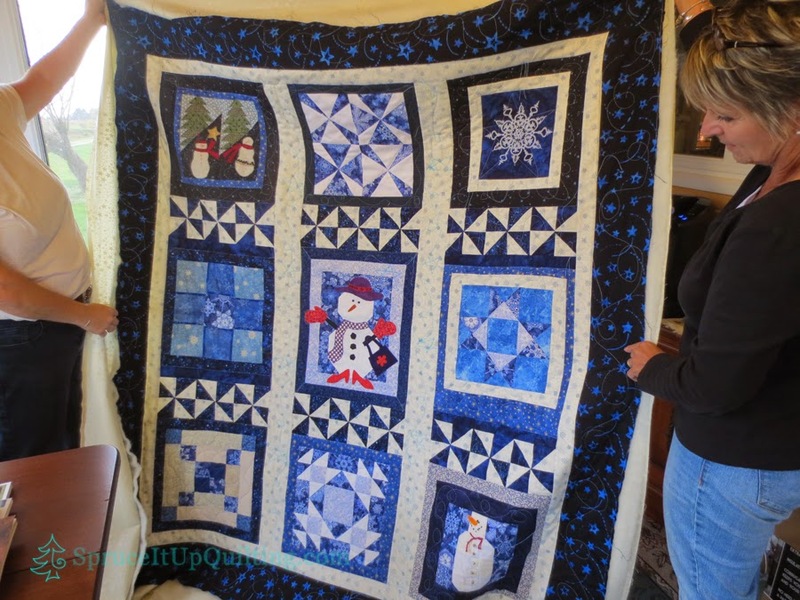 Love the snowman quilt. Seems so appropriate for this time of year. It is! However we could wait a little longer for snow. Tomorrow's predictions for it won't please anyone! Thank you for stopping by Kathy.